Did you know that gardeners have a patron saint? Saint Fiacre is little known in English-speaking countries, but much more in France, where he was for many years one of the most popular saints. But why is he the patron saint of gardeners? And who is he exactly? The true story of St. Fiacre (Fiachra in Irish) is a bit nebulous, but most historians believe he was born in Ireland in the 7th century. Raised in a monastery in science and piety, he became an expert in the cultivation of edible and healing plants. Even as a youth his healing abilities were recognized and attracted crowds of worshipers. However, he wanted to live as a hermit, so he left Ireland for France in search of greater solitude. The Bishop of Meaux, Saint Faro, offered him a plot where he could establish a hermitage and there Fiacre built an oratory dedicated to the Virgin Mary. Although before long new followers began to surround him, Fiacre still lived in a simple bare cell apart from the others, eating little and sharing all that he had with patients who come for his healing. All the while, he personally took care of the gardens where his medicinal plants grew. Hence his reputation as the patron saint of gardeners. But the growing community soon ran out of space and supplies, so Fiacre went to see the bishop to obtain more land. Saint Faro offered him the “as much land as he might entrench in one day with a furrow”. Fiacre meditated on the subject, then got up and walked, dragging his staff behind him. The staff miraculously dug a wide and deep trench and even the trees fell “like stalks of wheat” when they were touched. Fiacre thus outlined a huge lot, amply large enough to support his entire flock. Saint Fiacre’s Seat and tomb in the church in Saint-Fiacre, Seine-et-Marne, France. Photo: Wikiwand.com. However a suspicious woman who witnessed the miracle ran to the bishop to denounce Fiacre as a sorcerer. Poor Fiacre, discouraged, sat on a rock which then molded to his shape, creating a comfortable seat. But the bishop did not believe the woman. Instead he saw Fiacre’s trench as a miracle of God and sent her home. Since that time, you can still find the trench Fiacre dug in the town of Saint-Fiacre, Seine-et-Marne, France, as well as Saint Fiacre’s Seat, a rock that seems moulded into the shape of a man’s posterior. But Fiacre had lost trust in women and banished them from the precincts of his monastery. Apparently any woman who did enter the monastery was struck by a divine punishment: hemorrhoids. Thus, Saint Fiacre is also the patron saint of hemorrhoid sufferers, from then on called St. Fiacre’s curse. Today even non-believers can enjoy his healing gift, as apparently you just have to sit on Saint Fiacre’s Seat to be healed of hemorrhoids. 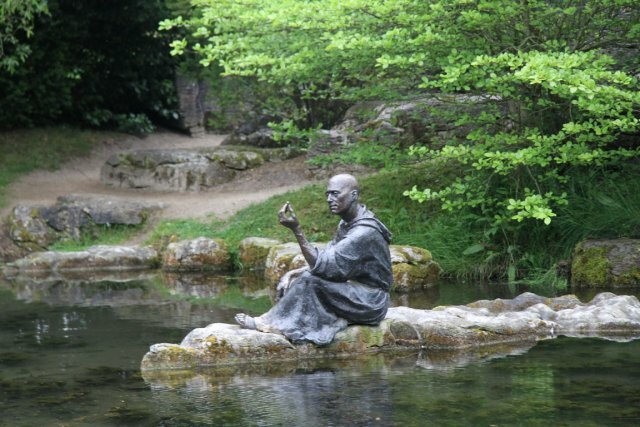 Saint Fiacre died as he had always wished, in piety, prayer and solitude, surrounded by gardens, on 18 August 670… and is still remembered around the world as the patron saint of gardeners. Of course, Saint Fiacre is also the patron saint of taxi drivers… but how that came to be is another story! I was not aware of this so thank you for sharing. There is some irony in that I’m guessing the majority of gardeners (flowers and veggies) are women while the men manage the lawns. Or do you have stats that say otherwise? I have to give you that! 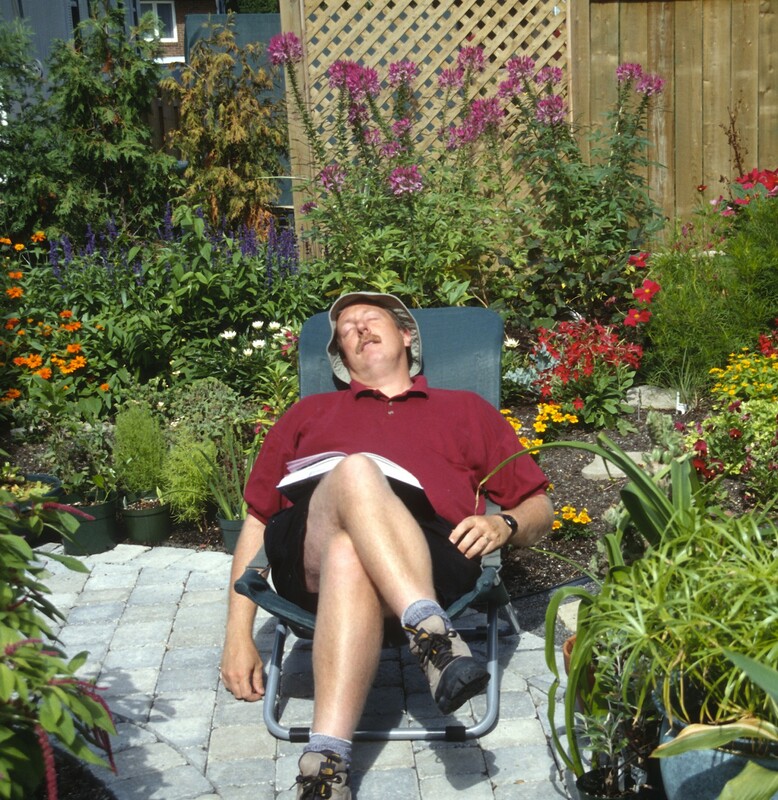 I can recall stats showing that men and women garden about equally, but what they did in the garden was very different.